For decades, The Black Widow has been one of Marvel Comics' good guys — a minor one, but still a good guy. And yet, she started out as a Soviet spy, at the height of the Cold War! America (in Tales of Suspense #52, April, 1964) to spy on Stark Industries and its CEO, debonair bachelor Tony Stark. Aside from being a major industrialist, Stark also happened to be Iron Man, a major superhero. The Black Widow was defeated, as befits a comic book villain, but — also as befits a comic book villain — she came back. Her "civilian" name, by the way, was originally given as Natasha Romanoff, which is not a name a Russian woman would use. The first time she fell under the control of a writer who knew that, it was corrected to "Romanova". In her third appearance (five issues later), Natasha latched onto Hawkeye, a fledgling superhero who had accidentally fallen on the wrong side of the law, and romanced him into helping her steal American secrets. But the scheme backfired. Instead of simply seducing him and moving on, she began to fall for him; and instead of her recruiting him as a pawn, he started her on the road to herohood. Hawkeye rehabilitated himself and joined The Avengers, and before long, The Black Widow had defected, and was sharing adventures with that group. They turned her down for membership a couple of times, because of her "Commie" background, but eventually allowed her to join. Tho her early attendance record was rather spotty, much later, she became a regular, and later yet served a term as the team's leader. She also lent her abilities (which came to include a lot more superheroey gimmicks and athletic skills than she'd had at first) to S.H.I.E.L.D., Marvel's answer to television's U.N.C.L.E., and to an Avengers spin-off that never quite spun — The Lady Liberators, which also included The Wasp, The Scarlet Witch and a couple of others, began and ended in Avengers #83 (December, 1970). The Black Widow got a brief series of her own starting August, 1970, when Marvel launched a couple of new titles which each featured two series, with equal billing. She shared Amazing Adventures (also the title of a fantasy comic the company had published a decade earlier) with The Inhumans, who had started as Fantastic Four supporting characters. But in the ninth issue, the latter series expanded to fill the entire book, and The Widow was out. It was then that she dumped Hawkeye for Daredevil. 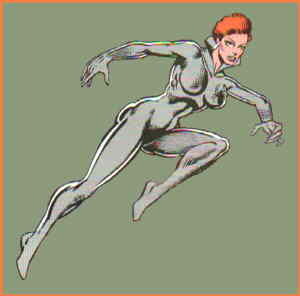 She made frequent appearances in his comic during the early 1970s, and even shared billing in his logo for a year or two. A couple of years after that, she led a short-lived group called The Champions, which also included The Ghost Rider, Marvel's version of Hercules, and a couple of ex-X-Men. It was decades before she appeared under her own logo again, and then it was just a mini-series in 1999, followed by another in 2001. She also hasn't appeared on TV or in a movie, or anything, really, except a Slurpee cup or two. But she's certainly an enduring character — even today, she can be seen from time to time, as a guest star or in a group setting. By the way — tho even her creators may not have known it at the time, this was Marvel's second use of the name "Black Widow". The original Black Widow, who appeared in 1940, was extremely obscure, but a far less run-of-the-mill character than this one. Text ©2001-09 Donald D. Markstein. Art © Marvel Comics.